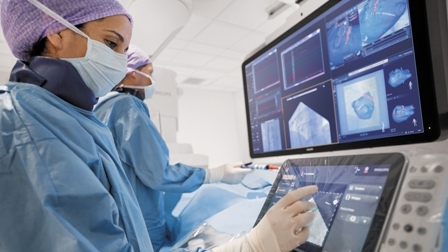 Royal Philips has introduced next generation image-guided therapy platform, Azurion, which will enable clinicians to carry out a range of routine and complex procedures in the interventional lab. Azurion platform is equipped with around 1,000 new components, including an advanced flat-panel detector and Philips newly developed ConnectOS operating system that help to incorporate real-time information from all relevant technologies in the interventional lab. The platform, which features an advanced design with a flexible interface, is installed with new workflow options and performance dashboard. Azurion platform can integrate firm’s planning and navigation software for areas such as vascular surgery, interventional cardiology, interventional oncology and interventional neuroradiology. At the interventional lab, the platform helps in identification and visualization of target organs and tissues, operation of interventional devices and placement of implants. All the components from the platform will work together to provide enhanced image quality at ultra-low X-ray dose and real-time image processing on multiple work spots within the interventional lab. Parallel working will allow clinicians to complete different tasks simultaneously in the interventional lab, helping to save time along with delivering quality work. To minimize preparation errors and reduce preparation and procedure time, Azurion includes procedure cards that will help clinicians to pre-program regular tasks and user preferences. Image: Azurion will support a full range of configurations across a broad spectrum of image-guided therapy procedures. Photo: courtesy of Koninklijke Philips N.V.